Chuuk Lagoon is undoubtably the shipwreck diving capital of the World. Its World War II shipwrecks are unmatched in quality and quantity anywhere. Most divers who go there only want to dive the wrecks (and I must say that I am one of them). On my trip in 2004 some in my group decided to do an extra dive on the second last day. This was a shark dive. When they did this dive (I could not dive due to problems I had earlier in the trip - see my article on this), I snokelled over top and could clearly see all that went on. In 2005 when I visited as part of an educational trip with some Australian dive shop owners, I was outvoted when the offer came up to do this dive or another wreck. Accordingly, I had to do this dive whether I liked it or not. Located to the north-east from the main township on Moen (Weno), you travel past the airport and then out towards the North East Pass. This is one of only a couple of large entrances from the open sea into Chuuk Lagoon. During the War, this passage was guarded by two 3 inch guns placed on Eli Kanibu island which is about seven kilometres south-west of the pass. The Japanese Lighthouse that people sometimes visit (on the north-east corner of Moen near the Xavier High School) was built to provide safe navigation through this pass. Anyway, you pass Eli Kanibu and you will see a small island. 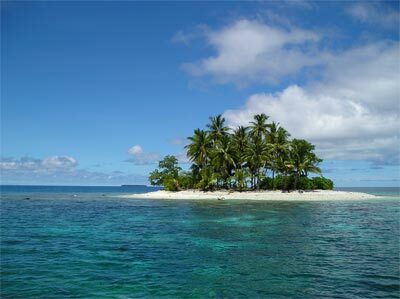 This is Shark Island (I am not sure of its real name). The dive boat anchors off the southern side of the island in about five metres of water. The winds push the boat back so that it is in about 10 to 12 metres. 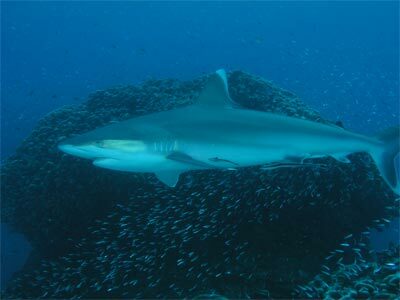 Once you enter the water, descend to the sandy bottom and you will see sharks almost straight away. When I did it there were about 10 sharks visible. You will see that the bottom slopes down to 18 to 20 metres and straight south of the island is a small coral bommie. This is about 15 metres across and sits up a few metres off the bottom. This bommie is nothing like I have seen anywhere in the World. It is a shark cleaning station. While we see fish cleaning stations all over the place, especially on coral reefs, even in New South Wales, this one is the only shark cleaning station I have ever seen. The sharks come in and hover over the side of the bommie. The cleaner wrasse come in and clean the sharks, moving in and out of the shark's mouth and gills. The sharks have to slow right up to let this happen. This means that the sharks stop swimming and this causes them to sink. As they do, you get very good chances to take photographs. The sharks come in, get cleaned, and swim off. Another shark takes its place. All the time this is happening, other sharks swim around the bommie, looking for an opportunity to get cleaned. 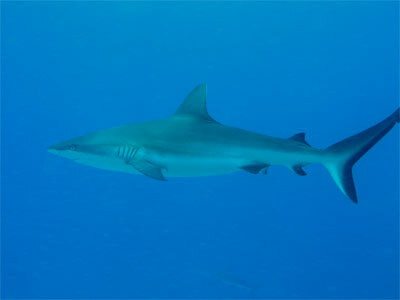 The sharks are white-tipped, black-tipped and grey reef sharks. On my dive there are probably about 15 to 20 sharks in the area. This compares to the year before when there were only six to ten seen in total. After 15 minutes we swim off to the west where there is a nice reef which is about 22 metres deep at the bottom. There are a lot of sharks around here as well. We take some photos of clownfish and anemones, some eels and other nice reef fish. Not a bad little reef, better than any I had seen in the Cook Islands a few months earlier. Anyway, we turn around and come back shallower (say 12 to 15 metres). As we swim back towards the boat and the bommie, the numbers of sharks increase. When we get to the area near the bommie, I estimate that there are at least 30 sharks around. I swim out by myself towards the bommie, at a depth of about 10 metres or so. I am half way between the surface and the bottom. The shark numbers increase even more, I can count at least 24 at any one time. I estimate that there must be at least 40 to 50 sharks in the area. The sharks are coming quite close to me and soon I have over 10 within 10 metres. I am taking lots of photographs when suddenly, the sharks go off. When I say this, I do not mean they go away, they go crazy, swimming madly in every direction, rushing right at me and go so close I am now quite worried. I turn onto my back and start swimming backwards and holding my camera in front of me to use as a weapon if need be. In over 2150 dives I have never before felt fear when in the water. I am not really scared, but I am a bit worried. Within a few seconds they have calmed down. I swim back to the boat and find the others there. Safety in numbers! A few minutes later there are only a few of us still in the water. I am next to another photographer, only ten metres from the dive boat. There are many sharks around, probably as many as when I was out over the bommie a few minutes earlier. All of a sudden they go off again. More than a dozen sharks are rapidly swimming past us, only centimetres away from us. Again, this is a bit of a worry. As quickly as they went crazy, they quieten down and all is calm again. I look at the diver next to me and he is certainly amazed by what has happened. I hear some laughing. Looking up, I see a diver who is now snorkelling. He has seen all that happened and is having fun at our expense. I decide it is time to get out of the water. Back on the boat much is said by the snorkeller and the other diver about what occurred and I tell them that it happened to me earlier. We all agree that this has been a great dive, but more is to happen. Safely back on the boat, the crew open up an Esky (cooler bin to non-Aussies) and pull out fish heads and remains. These are thrown into the water and immediately the surface is a thrashing, boiling mess. The sharks are going after the remains, fighting each other for the scraps. This goes on as long as the fish bits are thrown into the water. All the sharks, at least 40, are now within 15 metres of the boat. No wonder the sharks were getting a little frisky, they knew what was coming. This is a very good dive. Anywhere else in the World I would say it was a must do dive site. However, since this is Chuuk Lagoon, the best place in the whole planet for shipwreck diving, I can only say that it is a dive to do if you are sick of wrecks or have never seen many sharks. This dive is only done (as far as I understand) by the Truk Lagoon Dive Shop operating out of the Truk Stop Hotel.